Like Water For Hot Chocolate: Time to Cook the Books! Way back in the 80's, author Laura Esquivel published her glorious novel, "Like Water for Chocolate", which became a bestseller in Mexico, the U.S., and many other countries. The success of this novel, where food has magical, life-altering properties, has inspired many other authors to give chefs, food and recipes center billing in many other novels and even spawned a new subgenre of literature, the "foodie novel". Deb of Kahakai Kitchen, my wondrous co-hostess at Cook the Books, the online foodie book club, selected this great book for our February/March round and I was delighted to transport myself back to the early 20th century Mexican ranch belonging to the de la Garza family. Mama Elena is the iron-fisted ruler over her three daughters, and decrees early in the book that youngest daughter, Tita, must never marry until after she dies. This breaks Tita's heart, for she loves Pedro (I never did figure out why, as he just seems like a lunkhead to me), and her emotions throughout the book flow into her cooking and cause strange things to happen. Esquivel's book was the first that I know of that sprinkled recipes throughout the text, much as other novels have traditionally headed chapters with quotes from poems or other literary sources. There were many cool recipes for dishes and home remedies in the book that could have inspired me to cook and blog them up. I considered the sensuality of Quail in Rose Petal Sauce and the Mexican holiday classic of Three King's Bread. The thought of making my own matches, however, seemed unwise (and where does one purchase minium and powdered potassium nitrate, anyway?) 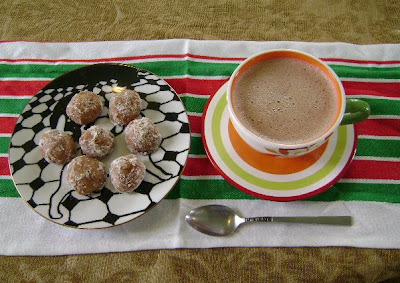 I found a blogging duo who actually cooked up a whole feast from the book (actually the movie version of Esquivel's book) and that seemed pretty intriguing, but ultimately I settled on making a treat of cookies and hot chocolate for my family on a blustery weekend afternoon. I followed my usual scratch recipe for hot chocolate from the back of the cocoa powder container (cocoa, dash of salt, warm milk and a bit of vanilla), spiced up with a hint of cinnamon. For accompaniment, I hit a bunch of cookbooks for Mexican baking recipes and chose to make a gluten-free version of Polvorones de Canela (Cinnamon Cookies) from The Moosewood Collective's cookbook "Sundays at the Moosewood Restaurant". I 've seen recipes for similar butter cookies rolled in powdered sugar called Mexican Wedding Cookies or Mexican Shortbread (add nuts). Other cooks from other countries also make cookie cousins to these little gems: Russia has her Tea Cakes (add nuts again) , Southern American cooks make Butterballs or Snowballs, and the Germans and the Dutch make Pfeffernusse (add black pepper and/or cloves). Obviously this many wonderful cooks from around the world must be onto something. 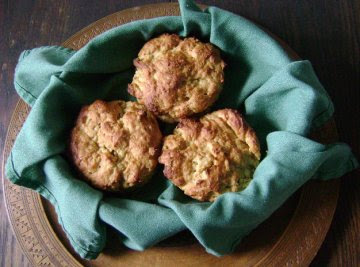 Adaptation of recipe for Polvorones de Canela from "Sundays at the Moosewood Restaurant" by the Moosewood Collective (NY: Simon and Schuster, 1990). Cream together butter and 1/2 cup confectioner's sugar. Add in 1/2 tsp. cinnamon, salt and vanilla. Mix together sorghum flour, brown rice flour and xanthan gum. Fold into creamed mixture and mix well. Wrap in plastic wrap and chill in refrigerator for at least one hour. Roll dough into one inch balls. Bake on greased baking sheet (I used parchment paper to line my cookie sheets since GF cookies tend to stick more easily. Mix together 1 cup confectioner's sugar with 1 tsp. cinnamon. Bake cookies 15-20 minutes or until lightly browned. Don't overbake as this will make them desert dry (one batch escaped my baking attentions and was terribly dry). Let cool for a few minutes and then roll cookies in cinnamon-sugar mixture while still warm. Let cool. These are terrific served warm with hot chocolate to dunk them in. They also pair well with coffee. Makes 30 cookies. Store in airtight containers. If you haven't read "Like Water for Chocolate" you are in for some great entertainment. There is still time to join our online book club (the deadline is March 26 to read the book, cook something up and blog about it) at Cook the Books, where our guest judge this month is Ben of the awesome food blog What's Cooking? Ben certainly knows his way around Mexican cooking, having grown up with restaurateur parents, and he also is a fan of Esquivel's book, as noted in his review on his blog. Deb will be organizing a roundup of all the participants' posts about the book and their inspirational dishes, and then Ben will give us his thoughts. Do drop by and check it out! Happy Anniversary to Ruth at Presto Pasta Nights for three years of celebrating the glories of our elbow macaroni, rotini, lasagne, pierogies, glass noodles, bow-ties and all the other shapes, sizes and types of pasta. This week Ruth is rounding up what might be a record-breaking number of pasta entries from cooks around the globe and I had to come up with a recipe to offer to the celebration. I was honored to host Pasta Presto Nights #130 last September and have sent in some pasta entries to various other editions of this fun weekly event. Each Friday Ruth or a guest host rounds up the pastas and we all get a carbo-loaded feast for the eyes. For my contribution to the party, I wanted to augur in Spring (actually Season #5, Mud Season, in these parts) with a delicately spiced and colored pasta. Some leftover smoked salmon was the inspiration for this pasta dish. We really like sushi in this house and we make it at least a couple of times a month in our kitchen. Youngest daughter is the Sushi Chef: she has the best rolling techniques and the most patience for cutting cucumbers and carrots into thin sticks for the sushi innards. We like making smoked salmon and cream cheese sushi rolls, and for this I buy packages of smoked salmon trimmed from the more expensive Nova packages in the smoked fish section of the supermarket's fish counter. A one pound bag will give us at least two sushi dinner platters, leaving the more sinewy, chewy bits of smoked salmon for grinding up in the food processor with cream cheese for an appetizer spread or for schmearing our breadstuffs. Melt butter in large heavy skillet. When it starts to foam, pour in wine and bring to a boil. 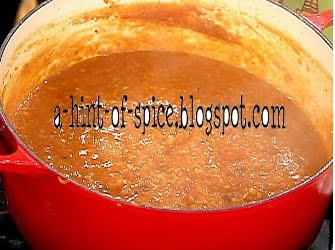 Reduce heat and simmer until reduced by half. Add smoked salmon and peas and saute until salmon turns light pink and firm. Sprinkle with dill and serve hot. 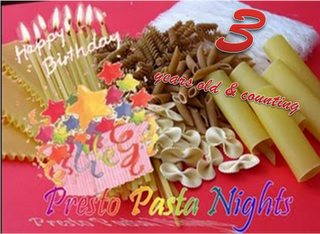 Congratulations again Ruth for 3 wonderful years of Presto Pasta Nights. Looking forward to the roundup party! I knew I was taking on a popular event when I offered to host My Legume Love Affair #20, but the number and range of leguminous submissions was truly astounding. Two years ago, Susan, the Well-Seasoned Cook, created this wonderful monthly food blogging event that educates us all about the world of legumes and how to cook them. For this 20th helping of MLLA there were a fantastic number of entries from many different countries and my hat's off to all the bloggers who introduced me to various aspects of Indian cuisine and cooking techniques. I have bookmarked at least a month's worth of recipes to cook up in my own kitchen sometime soon. As far as a favorite legume, chickpeas (garbanzos, ceci beans, etc.) seem to have won the popularity contest. 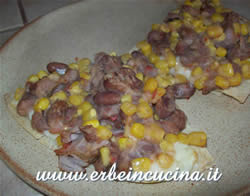 I counted 26 recipes containing this favored legume out of the 62 different posts from 44 bloggers for this event. The legume spectrum included green beans, red kidney beans, variously colored lentils and chickpeas, lima beans, pinto beans, pigeon peas, soybeans, peanuts, mung beans, black beans, adzuki beans, cranberry beans, horsegram, green peas, black-eyed peas, hyacinth or field beans, and split peas. 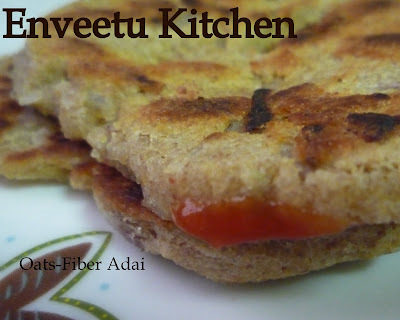 Coming to us from her home in the United Arab Emirates, Priya sent in three recipes from her blog Enveetu's Kitchen: a recipe for Oats-Fiber Adai , one for Minty Peas Rice and one for Sprouted Green Gram Pakoda. 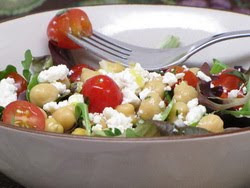 Priya also maintains a second blog to chart her healthier eating habits, A Healthier Me, and sent in a third recipe for Mixed Bean Salad. Here's a legume I never heard of before: Horsegram. 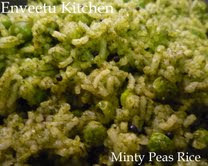 Asha at Foodie's Hope in North Carolina tells us how to cook up a South Indian kurma using this unusual legume, which also goes by the name of Kollu, Kulith, Uluvalu and also Hurulikalu, and can be sought out at Indian markets. Cranberry beans make an appearance here at MLLA #20 in Ginny of Just Get Floury's warming pot of Pasta e Fagioli (pronounced Pasta Fazool by my Eye-talian-American friends and family). Just the ticket on a cold winter's night. MLLA Founder Susan, The Well-Seasoned Cook, made an alternate version of this classic soup, adapted from a recipe from Italian cooking legend Marcella Hazan. Nithu was very busy in her kitchen this month. 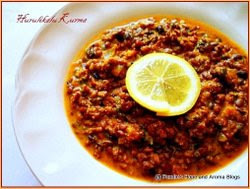 She cooked up some Hot n' Sour Field Beans, also known as Mochai or Hyacinth Beans, on her lovely blog, Nithu's Kitchen. 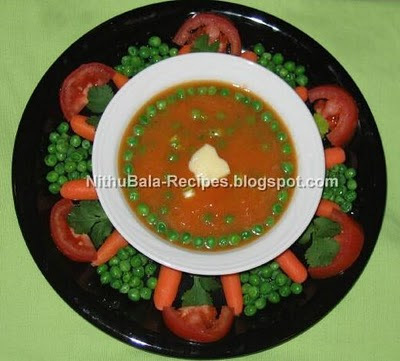 She also submitted four other artistically presented dishes of Spicy Chickpea, Tomato, Carrot & Peas Soup , a Broccoli, Cauliflower, Spinach and Lima Bean Soup and Mixed Vegetables and Fruits Salad. 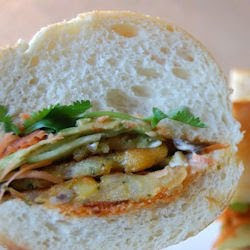 Kits Chow in Vancouver, Canada tried out a new veggie burger recipe using split peas and some Vietnamese and Korean influences in her Veggie Sandwich. She made a huge batch; some burgers to eat now and some to freeze for later use as appetizers and sandwiches. 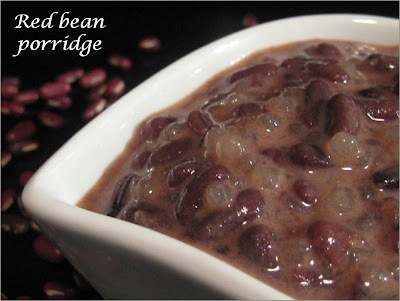 Azuki beans are the mainstay of this tasty salad which Brii serves as an appetizer or in larger portions as a main dish. Her Briiblog in English is not only a wonderful source of herbal information and recipes, but she shares her awesome photography of the Italian mountains around Lake Garda throughout the seasons. 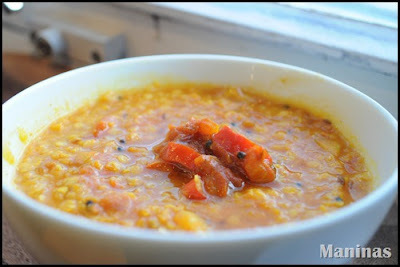 Red Lentils shine in Andrea's Gorgeous Tarka Dhal submitted by Food Matters: Maninas. Scrumptious! Darker Bengal gram was used in a similar spicy, yummy curry recipe on Denufood's blog. She tells us that the Bengal gram variety comes in a few more colors than regular gram or chickpeas, and has more fiber to boot. Coming to us from her kitchen and garden in Italy, Graziana of Erbe in Cucina made a tempting batch of Baked Hot Tortillas. Inspired by a restaurant dinner, Food and Laughter cooked up a colorful pot of Zuni Stew for her family. 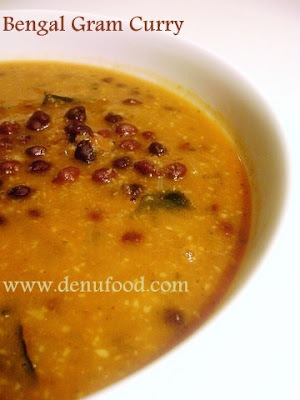 Jagruti sent in bowls of Black Eye Bean and Bell Pepper Soup and Creamy Daal Makhni from her UK-based blog, Joy of Cooking. Here at the Crispy Cook, I baked a batch of Chickpea Buns, spiced up with some whole cumin seeds. 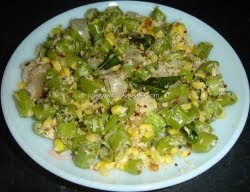 Kamala of Cook at Ease took a traditional South Indian stir-fry recipe but prepared her Green Beans Poriyal in a very modern and healthy way using her microwave. 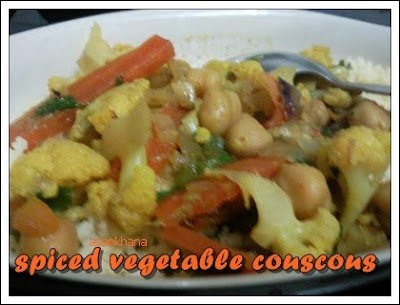 Sadhana made a batch of Spicy Baked Peanuts on her blog A2Z Vegetarian Cuisine and then sent in a second MLLA entry of Mixed Beans and Rice. 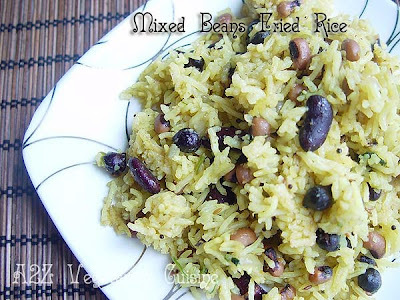 One can never have too many recipes for rice and beans, I say! 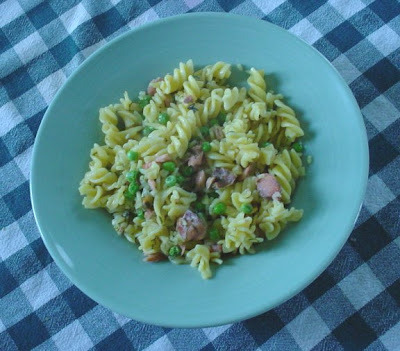 Lentils star in A Tutta Cucina's pasta dish, Pasticcio di Lenticchie e Pancetta. If you brush up on your Italian you will enjoy this recipe coming to us from a fine home cook living on the shores of Lake Garda in northern Italy. Zesty South Indian Kitchen chose red kidney beans for her most-loved legume this month and teaches us how to make Rajma Curry. Smitha offers culinary history insights on an ancient dessert, Gattakki Payasa, a porridge of broken rice, channa dal (split chickpeas), jaggery, cardamom, coconut and ghee. 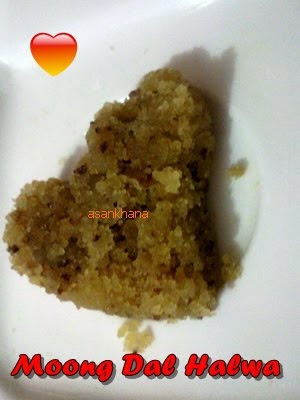 Her blog, Kannada Cuisine, focuses on the cooking of the Southern Indian state of Karnataka. 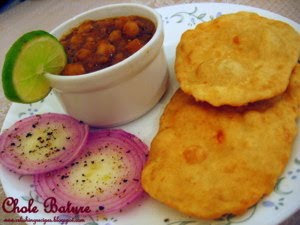 Be sure to check in at the Veggie Hut In Dublin, Ireland for recipes for Chana Dal Dilpasand and Chola Bhatura. I just want to dive into her stunning blog header photo of a bounty of fresh vegetables. Elisabeth of With Jam and Bread was inspired by North African cooking for her Chickpea Stew with Flatbread. This contribution to MLLA #20 is her first blogging event. Welcome and well done, Elisabeth! We can enjoy some dessert with Asankhana's Moong Dal Halwa and enjoy some photos of her family's trip to the Surajkund Mela, a traditional Indian arts and crafts festival held each Spring. 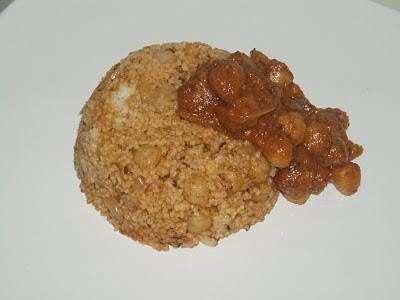 She also sent in a recipe for Spiced Vegetable Couscous so we had a savory legume entry too! 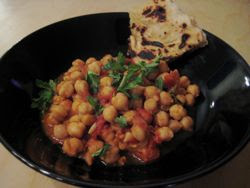 Chickpeas are the highlighted legume in Relishing Recipes' refreshing and beautifully presented meal featuring her version of Punjabi Chole. Deepti sent in three glorious MLLA submissions from her North Carolina-based blog A Hint of Spice. We can all revel in her Falafel Inspired Soup (chickpeas, tomatoes, garlic and spices), Aloo Chana Chaat (potato-chickpea curry) and Sweet Corn and Black Bean Salad. 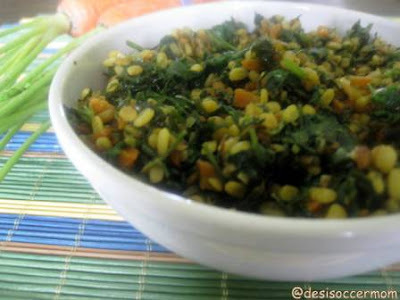 The Desi Soccer Mom, Jaya, introduces us to cooking with carrot greens in her creation of moong dal (split yellow lentils). 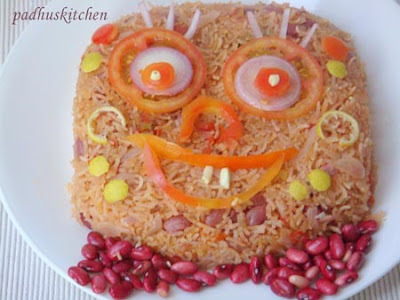 You can't help but smile when you see Padhu's Kitchen's take on Red Beans Rice, Indian Style. 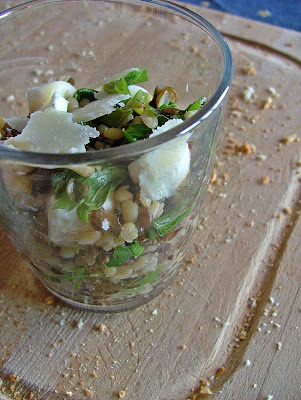 She has some other whimsical presentations on her blog, which is all about easy to cook recipes, served up with style! 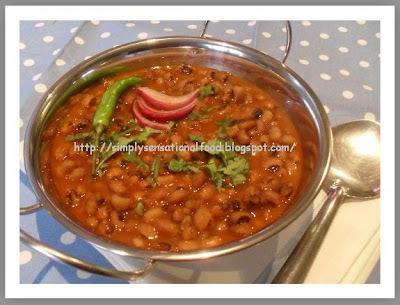 Nayna offered up a spicy bowl of Black Eyed Beans in Tomato Gravy also known as Lobia, as her contribution from her blog Simply.Food. 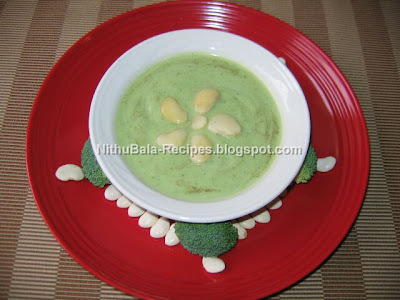 Ruchikacooks teaches us how to make Navarathna Korma, an Indian gravy, made of nine nuts and legumes and vegetables, giving different tastes with each bite. 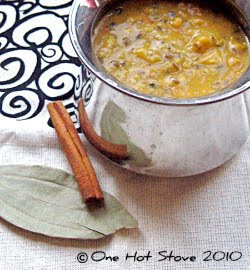 A Punjabi dal from Northwestern India was on the menu at One Hot Stove. 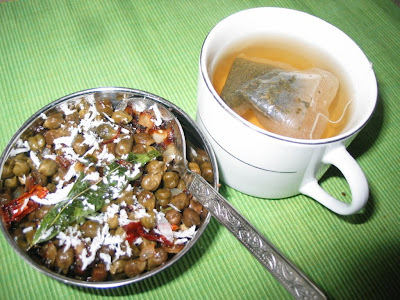 Nupur used black urad dal (split black lentils) and chana dal (split chick peas) for this homey dish. 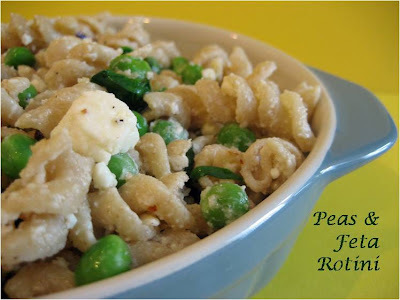 Lakshmi provided a whole meal with three legume recipes for us to savor from her new blog Palate Desires: Easy, Pea-sy, Feta-Rotini, Crunchy Green Beans (the crunch comes from grated coconut), and Sweet Red Bean Porridge. 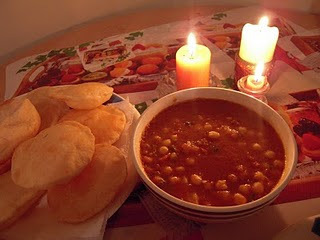 Sra of When My Soup Came Alive created a tempting couscous dish topped with spicy chickpeas in tomato sauce. 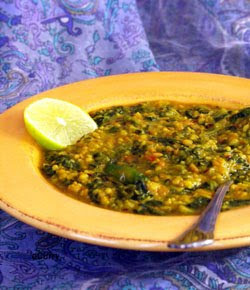 Yellow lentils, or moong dal, play a starring role in eCurry's Dal Palak, or Lentils with Spinach. 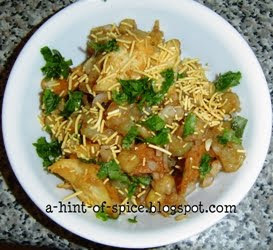 This one pot dish is perfect with roti or rice according to eCurry blogger Soma. Coming to us from her kitchen in China, PJ of Seduce Your Tastebuds teaches us how to make Soya Crisps. 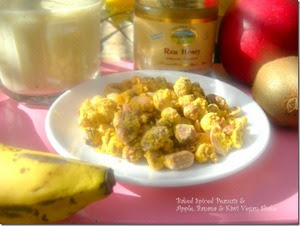 These healthy nibbles are made of soaked soybeans, tossed with oil and turmeric and then crisped up in the microwave. 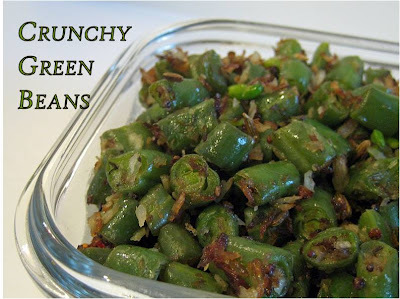 I tried this recipe out myself with a thawed package of frozen, blanched green soybeans from our summer garden and they were very good, though my old microwave needed a little longer cooking time to make them crispy. 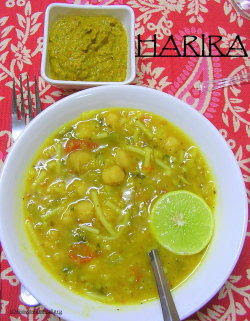 Sayantani of A Homemaker's Diary in India tried out a new recipe for her family, Moroccan Harira Soup with Harissa Paste. 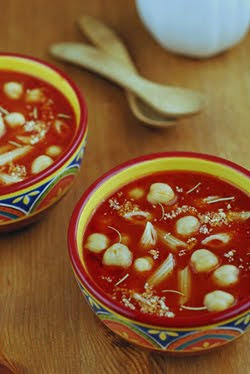 She managed to fit two legumes in this spicy Middle Eastern soup, red lentils and chick peas! 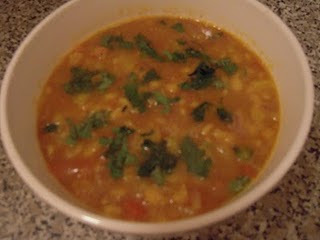 Brand new blogger Kiran of Sumadhura brings us a recipe for Khatta Meetha Chana Daal Rasam, or Sweet and Sour Chickpea Soup. 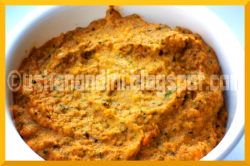 Welcome to the world of blogging and to My Legume Love Affair, Kiran! 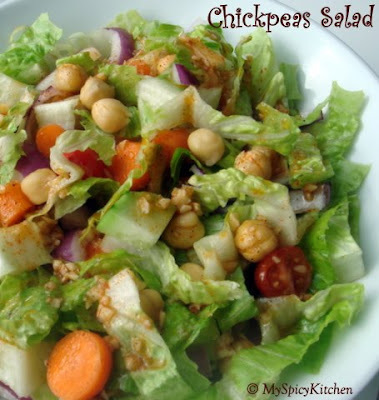 Another new blogger entered MLLA #20 as her first blogging event with a recipe for Chickpea Salad with Feta. Welcome Aileen from New Jersey, USA with her blog 400 Calories or Less! 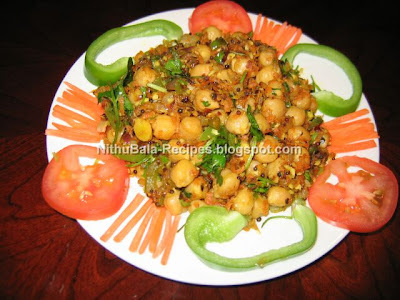 Nisha's Kitchen offers up a different take on Fresh Chickpea Salad using freshly shelled chickpeas cooked up with grated coconut, curry leaves, and other seasonings. Sounds delicious! Annarasa cooked up some dried pinto beans for Home Made Refried Beans and then put them to work as her base layer in her Festive Seven Layer Dip. Bean heaven! 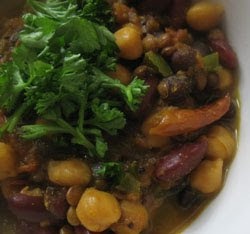 Lisa's Kitchen in Toronto cooked up Chickpeas, Kidney Beans and Lentils in a Spicy Tomato Sauce. Her vegetarian blog is the cohost of the monthly No Croutons Required Soup and Salad event which is a lot of culinary fun. Usha Nandini's Recipes sent in three dishes to tempt us with: Black-Eyed Peas, Pasta and Tofu Soup (2 legumes nestling in one pot! ), Peanut & Tomato Chutney and Baked Falafel in Pita Sandwich. Thank you three times Usha! 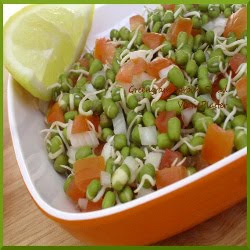 Suma sprouted up some greengram (also known as mung beans) and made a scrumptious Greengram Sprouts Salad on her blog Veggie Platter. As her contribution to our tasty virtual feast of legumes, Salt and Spice made up a pot of Mixed Vegetables with Dal, using toor dal (pigeon peas) from her no doubt heavenly-smelling kitchen. 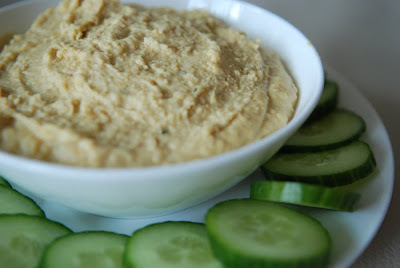 Saveur lets us know about her favorite spread, Peanut Butter Hummus, on her Canadian blog The TasteSpace. 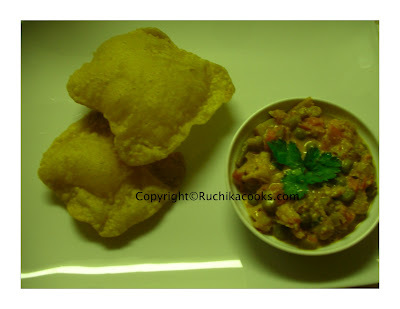 Rounding out our leguminous love, Usha from My Spicy Kitchen chose to divulge her ninth-month affair with a new love (hold your breath, here it comes) Mr. Chickpea! (now, exhale and relax). She made a spicy, garlicky salad with the new found object of her desire. It was so inspiring to host this wonderful 20th helping of My Legume Love Affair. So many people allowed us to sample their home cooking and I am sincerely grateful to each participant who took the time to cook, fuss over their photo and blog about their sweet and savory dishes. Thank you all for joining in this 20th helping of MLLA. And thanks to our wonderful founder, Susan, of The Well-Seasoned Cook, for starting us on this path to share our recipes and findings about our shared passion for legumes. And now to announce the winner of Susan's prize of The Pasta Bible, the randomly generated winner is: Kiran of Sumadhura. She will also receive the Hurst Bean Package. Congratulations Kiran! I think I got everyone included in this MLLA roundup, but if I inadvertently left anyone out, please leave a comment below and I'll amend this post to fit you in. And now I pass the MLLA torch on to Superchef at Mirch Masala who will be our gracious hostess for the 21st helping of My Legume Love Affair during the month of March 2010.